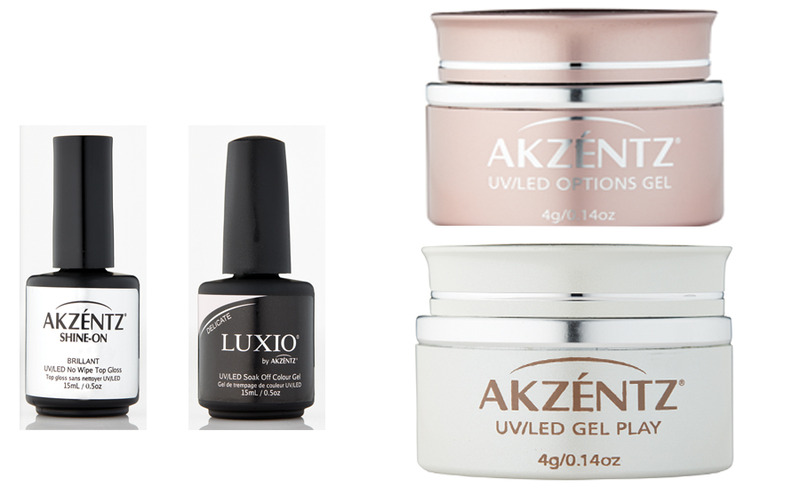 Perfect for creating delicate lacelike designs, Akzéntz Gel Play Lace is a highly pigmented soak-off UV/LED gel that can be used to produce crisp, vibrant nail art in a single stroke. Simply stir and brush on Gel Play Lace—available in white, pink and black—for an instant design. 1) Prep the nail with Prep & Wipe. Then, apply a thin layer of Options Opti-Bond to the nail, encasing the free edge. Cure. 2) Apply a thin coat of Luxio Delicate and cure. For more coverage, apply a second coat, and cure. 3) Use a detail brush to outline the lunula with Options Gel Art Black. Then, paint a St. Tropez French at the free edge of the nail. Cure. 4) Apply a thin coat of Gel Play Lace Black to the center of the nail, and cure. Apply Shine-On for a high-gloss finish, and cure.